Not really my porch, but if it were, I would sure invite you to come sit and visit. I often make the comment that no one sits on their porches any more. We are the only people in the neighborhood that sits on our porch. Now, some of the neighbors do come and sit with us. I think porch sitting is a lost art. It is a time to form friendships, to catch up on what is going on in the neighborhood, and a good place to discuss how to do/make things. When I go home and go visit my brother and his wife, we always sit on her front porch. And if we can't for some reason, we are wishing we could. Right now I am so anxious to have weather warm enough to sit out on our porch and have breakfast. Yeah, I guess I am complaining of the weather....I guess it is just human nature. Speaking of weather, we had rain this morn, and it rained harder than I think I have ever heard it rain for just a little while. Bit puddles are standing every where. It has warmed up quite a bit...and supposed to be warm for at least a day or two. 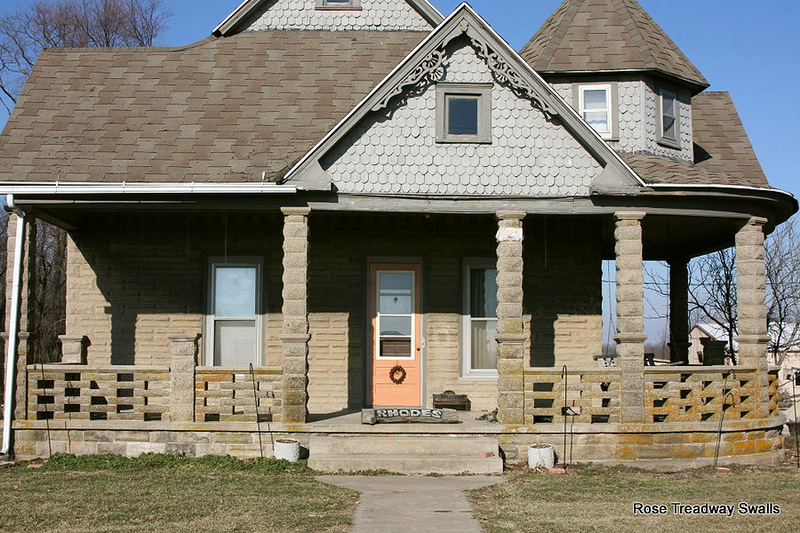 This house is so interesting and has some unusual features, like the brick or concrete designed railing around the porch. You are so right about no porch sitting anymore, it is the same here!! I think people have just gotten too busy to sit and watch the world go round! My best friend has a big side screened in porch and a big front porch with a swing. She never uses either!! Not only that, she is by the church and every day at six, beautiful church bells ring, She does not come out to hear them or sit on her porch either one. That is a cool house! I always wish I had a front porch. I would love to have a porch! Not many sit on them anymore. I guess everyone is too busy watching their big TVs or surfing the 'net. That is a pretty house, I love the gingerbread trim. We all used to know our neighbors, and people would get together and play cards, or have bar-b-ques. So much has changed. It's a pretty house! Maybe it will warm up enough for porch sitting soon. I like the extensive porch making it a major feature of this home. Nice shot.